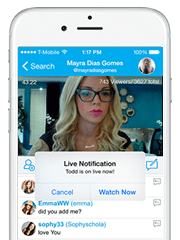 TwitCasting let you stream live video for free right from your iPhone/Android. Try TwitCasting Live to share the great moments with your friends andTwitter followers. On TwitCasting, a number of people enjoy streaming Live video. You can watch them on your PC as well as on your iPhone / Android. You do not need to install anything special to watch Live. You can watch live on your browser, anywhere, anytime. Please refer to How to watch for more detail about watching live. You can send comments and get real time feedbacks from the live owners. To post comments, you need to login either with Twitter or Facebook account. To login, just press the Login button. Your account will be created instantly on TwitCasting and communicate with the Live owners. Please refer to How to join for more detail about joining the live. The Live owners have their Twitter accounts. They usually post initial message to Twitter whenever they start their Live, so the best way to get the notification is to follow the live owners' account. You can also get push notifications by installing the TwitCasting Viewer Apps to your iPhone or Android, or installing the TwitCasting Alerts to your PC. Please refer to How to get Notification for more detail about getting the notifications. If you have an twitter account, then you are ready to start live streaming on TwitCasting. You can stream your live either on your iPhone, Android or on your PC. Please refer to How to stream live for more detail about streaming live. Watch live on your browser! You can watch all the lives by just clicking the TwitCasting link on your Browser. We do support default browsers of iPhone / Android as well as those of PCs. You may find it difficult to post comments when you are watching live on your iPhone browser. To enhance the live experience, we are distributing the TwitCasting Viewer App for free. You may feel more convenient to join live with TwitCasting Viewer App, so try downloading the App. Please refer to Download Apps for more detail about downloading the Apps. You can find recommended live on the home page of the TwitCasting, or on the first page of the TwitCasting Viewer App. The recommended lives are the filtered list of the popular lives. We recommend you to watch recommended lives at first to find the good live streams. We do support Radio Live as well as normal video live. Some live owners may use "music" mode to enhance the sound quality. You can watch all these lives with the same procedure but we put an category icons on the list of the lives for your convenience. Next, please refer to How to join for more detail about joining the live. You can sign in to TwitCasting with your Twitter or Facebook account by just clicking the login button. On TwitCasting Viewer App, you need to login with your Twitter account. 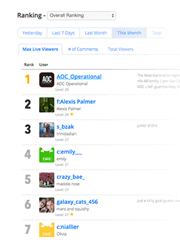 You can post comments to the live owners when they are on live, and your comments will be shared by all the viewers at real time. Your comments will be also posted to the Twitter/Facebook wall, but you can disable this feature by unchecking the 'post twitter' checkbox. Your comments will be always welcomed by the live owner, so please feel free to enjoy communication with the live owners. Next, please read How to get Notification for more detail about Notifications. We do support push notifications. Those will be sent to the subscribers when your favorite live owners got started their live. The push notification feature is supported on iPhone/Android as well as PC. You need to install TwitCasting Viewer App on your iPhone or Android to get the push notifications. When you have downloaded the App, please subscribe your favorite live owners by pressing the search button or subscribe button. You need to install TwitCasting Alerts to get the notifications on your PC. TwitCasting Alerts support Windows and Mac, and is for free. Once you have installed TwitCasting Alerts, you will see the green icon on your systems tray or Dock menu. You can open the setting menu by double clicking on them. Please refer to Download Apps for more details about downloading the Apps. Next, please refer to How to find live for more detail about finding the good live streams. 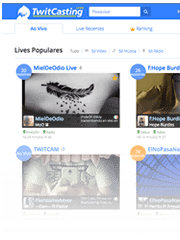 We believe the best live streams you want to watch is your followings' live. On TwitCasting, it is quite easy to subscribe your followings for push notifications. If you are using TwitCasting Viewer, please select "Add followings" menu. If you are using TwitCasting Alerts, please press "Add followings" button. Please wait for a moment after pressing the button, then you will get your followings who already have a TwitCasting Account. You can erase all the subscription list by a single click so we recommend you to try "add followings" at first to find the live owners. You can check the daily or weekly Ranking on TwitCasting web site. This may help you to find the entertaining live owners. You can check the recommended users when you pressed the search button (or clicked the recommended users on Android). This may also help you to find the good live owners. All the live owners have their level, which depends on the accumulated watch time of their live. This also may help you to see who is the most supported live owners on TwitCasting. Next, please refer to How to stream live for more detail about streaming live. To stream live from your iPhone or Android, please download TwitCasting Live App. TwitCasting Live is well designed to be able to stream live video even on the unstable 3G network. Please enjoy streaming live video to share the experience with your friends. You can stream live from your PC by signing in with your Twitter account. After signing in, please click the Broadcast link to start broadcasting. Please note that you need to have a web camera or microphone to stream live. And again, you can not stream live with your Facebook Account. Please sign in with Twitter Account to stream live. TwitCasting suppports private live, which is protected by a secret word. You can set your secret word on the settings menu of your TwitCasting Live App (or on the Advanced menu of the PC broadcaster). 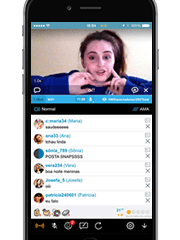 The private live is useful for sharing the live video among small group. Your first image when you've started your live will be used as a thumbnail of your live on TwitCasting web site. This image will largely affect the visitors whether to click your live, so please be careful not to get unfocused at the start. The live owners have their Level. You will get the higher level when more viewers watch your live longer time. So your level will increase by keep streaming live continuously. We will let you notify when you have a new level at the top of the TwitCasting web site, so please check your level periodically. TwitCasting have a live mode and you can change it to Radio Live or video live. You will get more options on your live mode according as you get newer level. Please select the best live mode depends on your network environment or your stream contents. Now we belive you are ready to install the App. Please refer to Download Apps for more detail about downloading apps. Search "TwitCasting" on App Store. 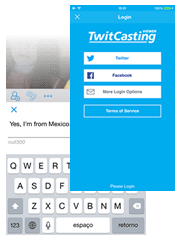 Search "TwitCasting" on Android Market. Please refer to Help Page for more detail about the TwitCasting. Bienvenido a TwitCasting! A continuación una lista útil! 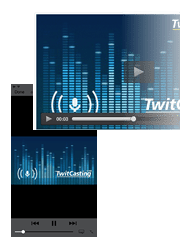 Para obtener ayuda sobre TwitCasting. Para saber más sobre "Seguir Opciones" para conseguir más seguidores.